As with many of the blogs I now follow daily, I found today's guest poster via twitter. Hi Sugarplum is my favorite kind of blog - fun and fresh about a woman and her style - decor, fashion and DIY. Just looking at her blog header brightens my day. So naturally I just had to know what her favorite nook was and its a goodie. Who is ready for a kitchen makeover? Hello, I'm Cassie from Hi Sugarplum! Thank you to Mrs. Limestone for inviting me to guest on her awesome blog!  Brooklyn Limestone was one of my very first blog crushes (some may consider it an addition), and I've fallen hard for many other blogs through this 'Nook' series...so I'm a beyond giddy to be included! Actually, I hope she doesn't have me confused with someone else...but I'm grabbing the chance while I have it! I have so many spots in my house where I love to curl up, but my kitchen is the room that gets my heart racing the most. It probably has something to do with how homely it was when we moved in. I'm warning you now...shield your eyes because this room was beat with the ugly stick. Told you! We're a family of Crystal Light lovers...not a good combination with white Formica counter tops! And yes, that is a manual flip-clock on the wall oven. We lived with this kitchen for five years, so it's no wonder that I'm still obsessed with the new version a year-and-a-half later. We kept costs down by having the cabinets re-faced instead of replaced, and added an extra tall crown molding to give them more heft. (Heft in cabinets = good; Heft in my back end = not so good.) All the stainless appliances are from Ikea, and we did many of the accent touches ourselves...like backing the glass cabinets with fabric and choosing hardware and fixtures from budget-friendly places like Lowes, World Market and Target. I'm thinking of painting the walls and ceilings an icy blue/gray, and plan on turning my attention to the Breakfast Room next. (Well, after I finish my Daughter's Room, and the Living Room. Ok, Breakfast Room will be completed after the Dining Room!) Is a room ever really complete? Not in my house. Most Saturday mornings I can be found sitting at the sunny breakfast bar; blogging and catching up with all my favorite blog reads. But as happy as the Kitchen makes me, the most joyful nooks in our house would have to be snuggled up in my son's and daughter's beds....reading books, hearing about their day, and humming them to sleep. The world slows down during those times, and there's no place else I'd rather be. Thank you so much for having me over today!! Love Cassie's blog! But I don't think I've seen her kitchen before - it's so lovely!! Cassie is such a sweetheart and I loved seeing more pictures of her home here- the kitchen is so lovely- adore the light granite and fabric backed cabinets. Gorgeous. I love the glass subway tiles...and the dark cabinets LOVE them. Now, I'm off to check out their blog. Love Cassie's blog and her house is so lovely! Particularly loving that subway tile! Oh, I just love Cassie! Her kitchen is beautiful. I love how unique and pretty the subway tile it. Love Cassie and her blog! Her kitchen is awesome! Wow, I love it! Cracked me up with your comment about licking your subway tile - but I'd probably do the same! WOW, what a a change!!! You did a wonderful job on that makeover, agreed, that is a favorite nook! The transformation is dramatic and the final result is lovely, but I think you're seriously over-dramatizing the befores--they were ugly and dated, but hardly unlivable. I've been living for three years now, while we renovate our 150-year-old Victorian, with a completely unusable kitchen. We're using the former "Butler's Pantry" as our kitchen--it has eight total cabinets, most not wide enough to fit a modern-sized dinner plate inside, let alone a skillet or wok. We have no working oven (because the one in the actual kitchen doesn't work and there isn't ANY place to put one in our makeshift kitchen), so I cook and bake with an electric skillet, a hot plate, a microwave, and a small toaster oven. Don't misunderstand, I'm not complaining--my kitchen situation is awkward and very ugly, and frustrating beyond belief, since I'm an avid cook and baker, but I'm sure there are plenty of people trying to work out of kitchens even less usable. Plus, we bought this house (our "Dream Home") knowing we'd have to improvise for a while. I wouldn't have liked having to cook and work in your former kitchen. There doesn't appear to have been a nice stretch of countertop and, you're right, it was a bit unsightly, but I think you were a lot more fortunate than you realize. All those cabinets? An oven that while unattractive and old, still worked? A built-in microwave? It was more than serviceable--there are a lot of people who would happily take over a kitchen like that. I don't know you, I've never read your blog and I try not to judge, but this post made you sound like such a spoiled brat. Kate - not sure why you are reading this post as an attack on your own home but there is no reason to call anyone names. Its a beautiful renovation and I'm so happy she shared it with us. Thanks Kate. I was also going to mention we have indoor plumbing, but I thought it would come across too braggadocious. Mrs. Limestone, I'm flattered to be here...thank you so much! Love it. I am ready to jump through the computer screen to steal those seagrass barstools. Love the unexpected sparkle of that chandelier over the sink too! And I think you've helped me find a new blog to read! Love Cassie's blog and her kitchen! Wow! I love Cassie's blog and her kitchen is a beautiful transformation. Love the subway tile and her granite choice is beautiful. She's done such a wonderful job with her whole home. Love the kitchen redo....so many great saving tips!! The children's bedrooms are darling, I can see why this is a favorite "curl up" spot!! I love, love, love your kitchen! It's beautiful; I can't wait until we buy a house so I can do something similar in mine. Thanks for sharing! I love the dark kitchen, I remember when I told my painters I wanted my kitchen cabinets painted BLACK they gave me one LONG stare! I received more compliments on that kitchen and I think it truly was the icing on the cake when it came time for us to lease out that condo. Great job!